We flew in to our lake on Wed and had beautiful weather. There must have been 20 goats in the bowl we were in and we were pumped. We each had a tag and were hoping to score on a couple of nice billies. The next morning we spy 2 billies high on the mountain and go after them. An hour of climbing, crawling, and slipping, we were at a point to split up and shoot each of our animals. Tomas won the coin toss so I was to wait for him to shoot before I could shoot. I crawled up one more finger and took my pack off for the final 200 yards. After marking my GPS, I took one more look and noticed some white over the next rim of mountain. I looked through the binos and saw it was a goat and it was within rifle range. Dropping down to rest off my pack, I jacked a shell in and waited for Tomas's shot. I waited and waited and waited and waited. Finally, my patience was up and I slid the safety off on the Tikka. Resting the crosshairs on the shoulder of the billy I breathed out and started to squeeze..... My conscious got the best of me, must be the Catholic thing, but I put the safety back on and waited for Tomas's shot. A minute later, a shot rang out, and my goat flinched! I swore and started to shoot at the Billy as it ran up the mountain. Wounded, the goat laid down. I looked through my scope and couldn't see blood coming from it mouth. Worried that the Billy might escape into the sheer rock face that rose 20 yards behind it, I shot again and Tomas yelled that I got him and he was rolling. Looking through the scope, the goat was rolling with it legs going through the air! It took us a minute to find it, but when Tomas picked up his head, I saw it was a dandy (fish and game taped it at 10 inches). Upon inspection, the goat had been hit tree times. There was a bullet through the liver, through the lower front leg and one behind the shoulders. I was pretty surprised to see or hear Tomas shoot the goat I was after, but it was confirmed that he had not seen his goat. He saw this goat and thought it was the one he was going to shoot. The fog was getting pretty thick when he squeezed off his first shot and hit it in the liver. Immediately, the fog rolled in and remained that way for the next 3 days. We got the goat off the mountain and spent the next day fleshing it. The following day we tried to get to the salt water. We spent THE WHOLE DAY trying to get down and could not find a way. We would walk a 1/3 of a mile and run into a 20 foot cliff. We repeated this all day long. Giving up, we made our way back to camp and called our pilot. We asked him to come and pick us up on the lake. He agreed, but the weather would have to be perfect. We woke up the next day to clear and sunny. I called the pilot and he said he'd be there in 45 minutes. We never saw the mountains until the day we left and all of the goats were gone. This was an awesome, but eyeopening hunt. I was warned about the thick vegetation that borders the saltwater, but nothing can prepare you until you experience it. I hope to go again and get a goat of my own. 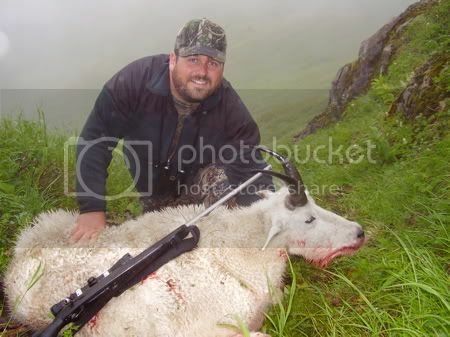 The picture is of me holding the goat that we shot. Congrats on the goat and good story. I see that is a tikka finnlight, but what caliber? Fantastic story, picture, and animal...thanks for sharing! We were both shooting Tikka T3 Lite Stainless in .270 WSM. This is the first animal I've shot with it and I really like the gun and the caliber. The one bullet that I know I put in it was found just inside the hair on the back side of the ribcage. The shot was about 270 yards and the 140 Accubond mushroomed perfectly. I haven't weighed the bullet yet, but it looks like it retained a lot of weight. Congrats Kusko, glad to hear you guys got one and a real brute too. Great hunt and story. Congrats, Kusko! Man that's a nice goat. Congrats to both of you. I just bought a 270wsm chambered in 270 wsm and I love it as well I am putting 150 noslers in a 6" circumpherfence at 534 yds.. hopefully I can close the distanc on a ram in a couple of weeks, but the leupold mil dot is performing well. You bought a 270 WSM chambered in 270 WSM? Hehe.